Joshua Tree has so many unique places and experiences to enjoy. The Sound Bath at the Integratron is a must-do! This magical place has an amazing history and you have to experience it to believe it. They have several slots open on Friday 10/20 of BRO5 weekend if you would like to book a sound bath. It is such a cool experience. 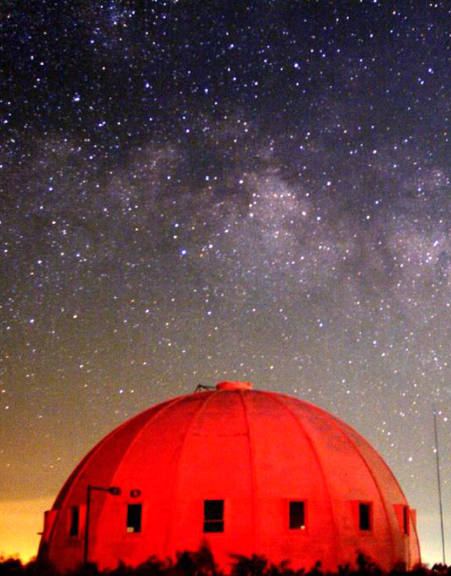 Read on to hear more about the Integratron and see how to reserve you spot. They fill up super fast so don't wait!!! This historical structure is a resonant tabernacle and energy machine sited on a powerful geomagnetic vortex in the magical Mojave Desert. The Integratron is located in Landers, California, 20 miles north of Joshua Tree National Park. Its creator, George Van Tassel (1910-1978), claimed that the structure is based on the design of Moses’ Tabernacle, the writings of Nikola Tesla and telepathic directions from extraterrestrials. This one-of-a-kind 38-foot high, 55-foot diameter, all wood dome was designed to be an electrostatic generator for the purpose of rejuvenation and time travel. The location of the Integratron is an essential part of its functioning. It was built on an intersection of powerful geomagnetic forces that, when focused by the unique geometry of the building, concentrate and amplify the earth’s magnetic field. Magnetometers read a significant spike in the earth’s magnetic field in the center of the Integratron. The Integratron is privately owned by three sisters who have been part of the restoration and maintenance of the structure and property for more than 30 years. Their focus is to restore and preserve the structure while sharing it with people interested in its potential. Since their tenure, the Integratron is open to the public for the first time in its history while its restoration continues. The Pop Up Sound Bath is a group appointment where we combine multiple requests into one group session so people can have a Sound Bath appointment if they do not mind combining w/ others. 1. Click on the Group Pop Up Appt tab on the right side of the Sound Bath page. 2. Click on the "Book Now" green button. 4. Choose the appointment time you prefer. 5. Follow the prompts to enter your credit card and confirm your reservation. 6. Look for your email confirmation after booking for important information about your visit.